Yesterday I popped in my local park and I watched three just hatched moorhen chicks with an adult. This pair of moorhens usually nests high in a willow tree, in the main fork of the trunk. I have seen one of the adults several times up the tree in the last few months, but I failed to find the nest. 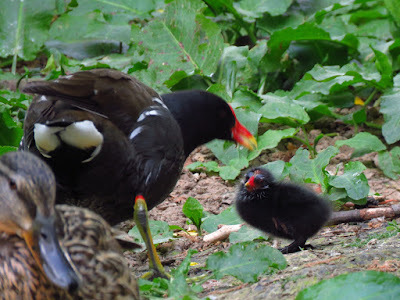 Today I went to the park again to check on the moorhens. 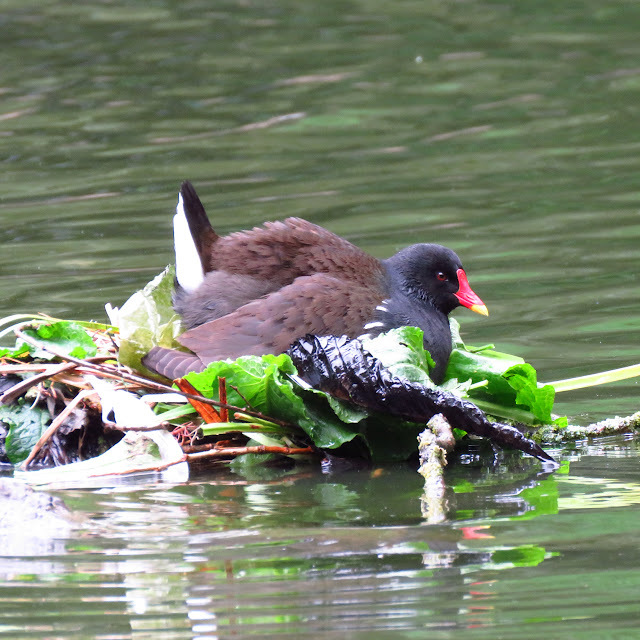 I was surprised to find the female brooding the chicks on a new nest by the island (top shot), which wasn't there yesterday. The male was busy bringing her sticks and leaves. He would find a stick or leaf on the ground, run to the shore and swim as fast as he could to the nest and pass the material to her partner. The female was fluffed up and looked double the size of her partner. She was sheltering the young under her wings. 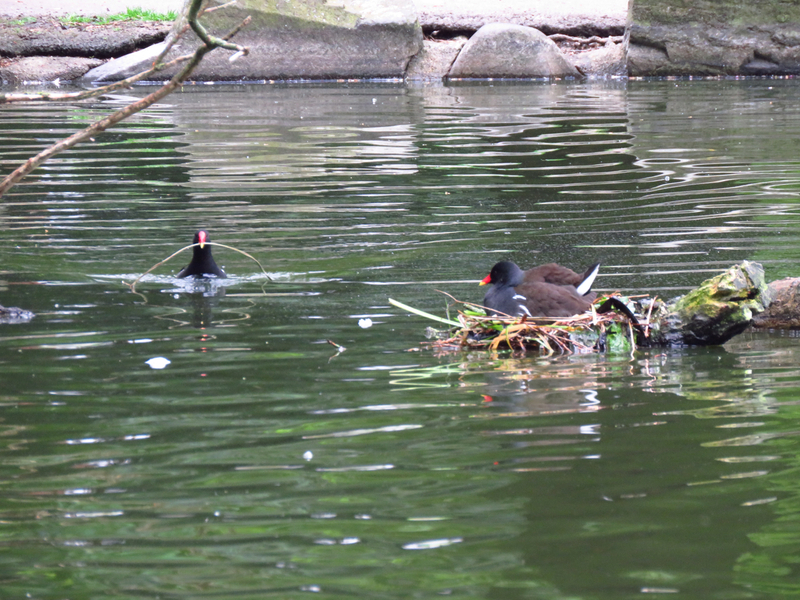 If I hadn't seen the chicks yesterday I would have assumed the moorhens were nesting anew. Once the chicks leave the nest in the tree for the first time, presumably jumping to the ground or the water, they can't climb up the tree again. 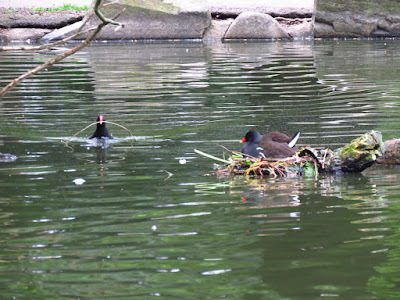 These adults are being very resourceful by building a second brooding nest for the chicks to shelter when they are still small and cannot thermoregulate properly. One of the moorhens with chick yesterday. 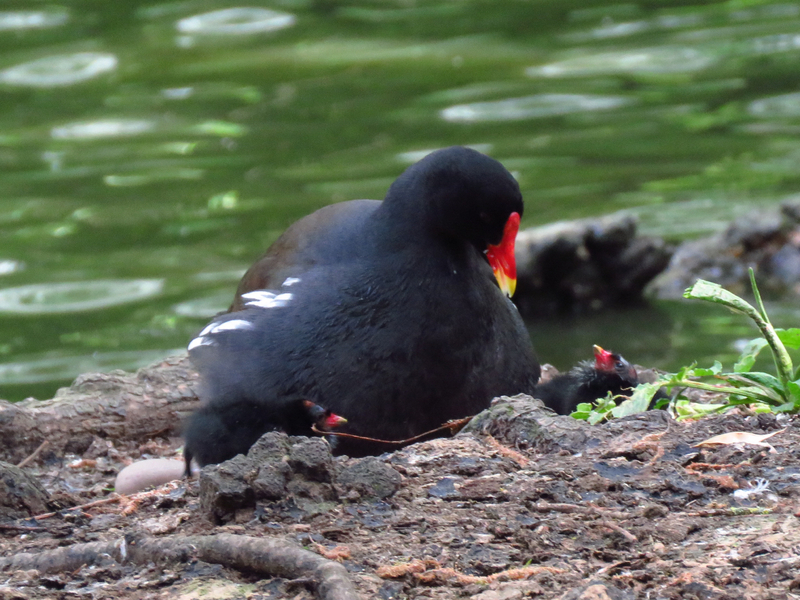 The moorhen sits and the chicks get in to be brooded one after another. 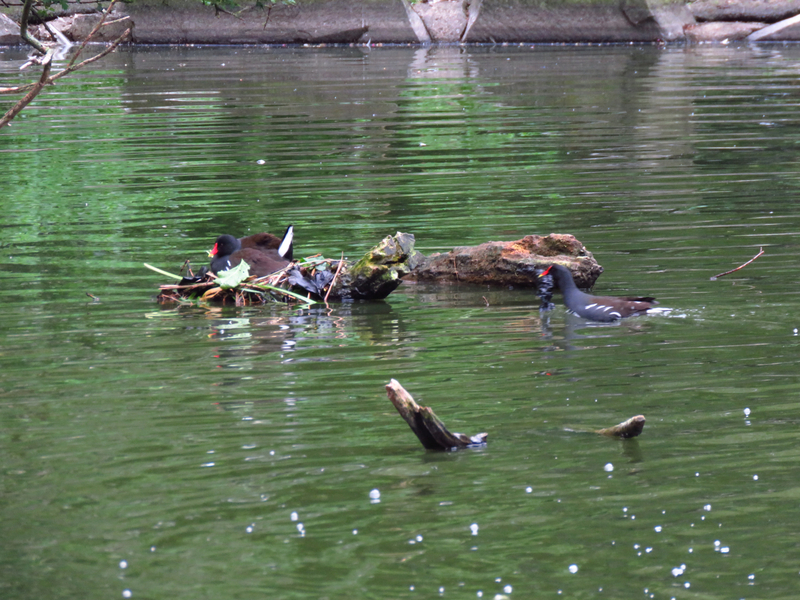 She pulled a few small twigs towards her as she was brooding them (photo from yesterday). Male coming in with a stick. A rotten leaf will do as nest material too. Lovely pictures, and thanks for the information. I've seen these hastily built Moorhen nests, and wondered why they were necessary.